With the help of a dramatic narrator, Marine Biologists, Geologists, and other experts (including a workman from the crew that first found oil in Saudi Arabia) viewers are walked through the history of oil – from the shale accumulations millions of years ago (during the Jurassic) to today’s use of oil in our daily lives. From the first oil well in Pennsylvania to Zoroastrian religion to the development of the modern petrochemical industry, this documentary especially focuses on how deeply embedded oil is in regards to everything we do (“from our food to our clothes to our medicine cabinets to our toothpaste”) and then goes on to ask what we will do as our seemingly unending supply of oil begins to run out. It’s at this point that the film shows its age as experts predict when the peak of oil production will be reached and one expert predicts 2008 – two years ago, while another predicts 2010. Not being an expert on oil I can’t speak to whether these men have been revealed to be accurate or not. There are times when the documentary feels a little too dramatic, especially when the story gets into the release of CO2 into the environment: “Hidden in the black magic of an oil reservoir is a climate demon from the distant path, and we release it at our peril.” Though the data presented here to support this claim makes it justified, the imagery is a bit more over-the-top than a typical scientific explanation. 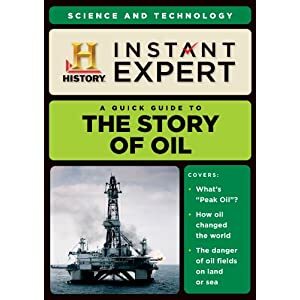 If it’s not clear enough that this documentary is filled with information that spans a number of fields, the DVD insert makes this obvious by stating that “The Story of Oil is appropriate for high school students studying History, Science, Current Events, Economics, Political Science, Technology, and Social Studies.” Under the headlines “Extended Activities” and “Discussion Questions” the creators of this film have included an interesting selection of activities and a list of questions that help to expand on the information presented in the 94 minutes of the film. With the BP oil spill in the Gulf of Mexico earning record-status and around the clock news coverage, getting a brief (yet solid) background in the story of oil is a welcome opportunity for students of all ages. No user commented in " Movie Review: A&E Instant Expert: A Quick Guide to The Story of Oil "